In 2003 the historic Kitty Hawk Pier was smashed by Hurricane Isabel after it had just undergone $300,000 in renovations. 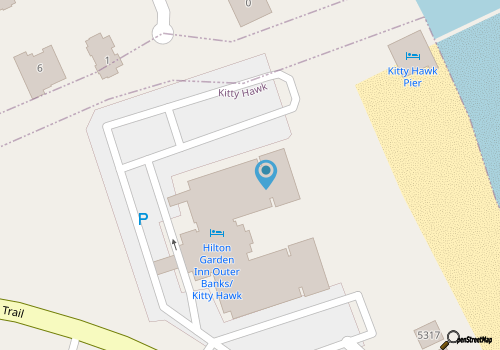 Purchased in 2006 by Kitty Hawk’s new Hilton Garden Inn, the pier was remodeled and then reopened in 2008. The newly renovated Pier House now serves as a unique setting for wedding receptions and other social events, enhanced by the environment and tradition of the Outer Banks. But the pier itself still remains open to the public for fishing -with a purchased pass. Sitting on high pilings over the Atlantic Ocean, the Pier House is 2200 square feet and features a beautiful natural wood interior with high ceilings and rafters and seating for roughly 125 guests. The bride and groom can have their wedding ceremony right on the beach, their first dance on the pier deck, a reception inside the Pier House and their honeymoon at the Inn, without having to travel anywhere. The Inn, which sits just behind the pier is staffed with wedding coordinators who will make all the arrangements. Weekly and yearly passes for fishing can be purchased at the front desk of the Inn for $30 and $125.00. Though the pier was shortened by a more recent hurricane, it’s said to still be a good site for catching spot and drum. Kitty Hawk Pier and Pier House are open year round for fishing and special events. Call 252-261-1290 for current hours.